Major General Gilbert du Motier, the Marquis de Lafayette, was a hero of both the American and French revolutions. Though Lafayette initially hoped that Napoleon would serve the cause of liberty, he was soon disillusioned. His low-key opposition and refusal to accept office under the Consulate and Empire made the Marquis de Lafayette a continuing thorn in Napoleon’s side. 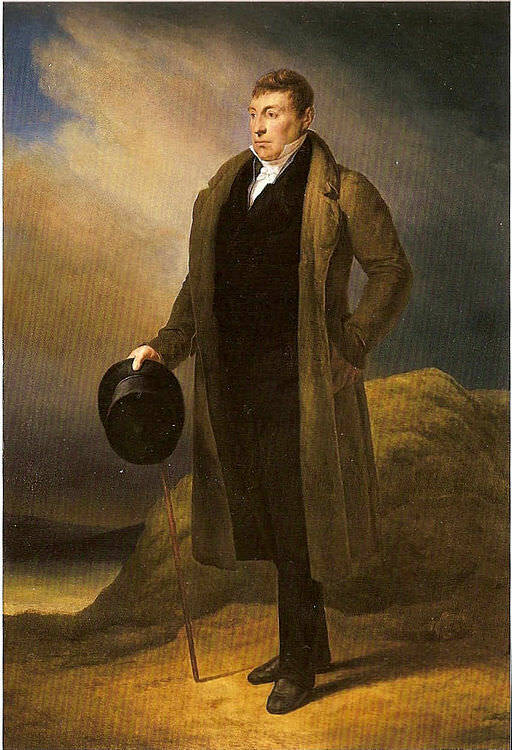 Marie-Joseph Paul Yves Roch Gilbert du Motier de Lafayette was born in Chavaniac, France, on September 6, 1757 to a wealthy noble family. At the age of 13, he joined a company of the king’s musketeers. In 1773, he was posted to the regiment of Noailles as a sub-lieutenant. His marriage was arranged to Marie Adrienne Françoise de Noailles. He moved in with the Noailles family, who were connected with the French royals. Lafayette trained at the riding school of Versailles with the dauphin (Louis XVI), the Count of Provence (Louis XVIII), and the Count of Artois (Charles X). Although he and his wife regularly attended Marie Antoinette’s balls, Lafayette did not care for the frivolousness of court life. In 1777, the Marquis de Lafayette sailed to North America to assist the Americans during their revolutionary war against Britain. Back in France, he was elected to the Estates-General of 1789. He helped write the “Declaration of the Rights of Man and of the Citizen.” After the storming of the Bastille, Lafayette became commander-in-chief of the National Guard. He tried to maintain order and protect the rule of law as radicals gained in influence. In 1792, Lafayette denounced the Jacobins and other radicals. A warrant was put out for his arrest. He fled from France, but was captured by the Austrians, who imprisoned him in Olmütz for his role in the French Revolution. His wife and two daughters were eventually allowed to join him. By now you will have gathered that liberty was a bit of sticking point between Napoleon and Lafayette. Still, they remained on friendly terms. As Napoleon gradually began to admit exiles back into France, Lafayette asked for the names of his friends and relatives to be removed from the list of proscribed persons. Napoleon granted this request. Napoleon also (through intermediaries) invited Lafayette to join the Senate and offered him the position of ambassador to the United States, but Lafayette refused. He provided a more extended rationale to Napoleon in a letter dated May 20, 1802. The Marquis de Lafayette retired to his rural estate of La Grange, east of Paris. In 1804, Joseph Bonaparte again made an attempt to get Lafayette on side by offering him an elevated rank in the Legion of Honour. Lafayette refused, saying it was the chivalry of an order of things contrary to his principles. Irritated by Lafayette’s refusal to support his government, Napoleon refused to promote Lafayette’s eldest son George above the level of lieutenant. George had repeatedly distinguished himself in the army, particularly at the Battle of Eylau. George and Lafayette’s son-in-law Louis de Lasteyrie – similarly discriminated against – both quit the French army in September 1807. Though the Marquis de Lafayette had misgivings about the return of the Bourbons in 1814, he found Louis XVIII preferable to Napoleon. When Napoleon escaped from Elba and landed in France in 1815, Lafayette rushed to Paris to oppose the Emperor’s return. By 1820, Lafayette was pessimistic about what could be accomplished in the Chamber. Just as he does in Napoleon in America, Lafayette became involved in liberal plots to overthrow the Bourbons. He lent his name and his money to enterprises that had little chance of success. Most notably, in December 1821, Lafayette and his son George started out in their carriage to join a planned rising at Belfort in Alsace. Lafayette’s longtime servant Bastien (Sebastien Wagner), who also appears in Napoleon in America, joined them. Warned en route that the plot had been discovered, Lafayette diverted the carriage to a nearby town. He stayed with a friend and concocted a plausible excuse for the trip. Though the government tried to implicate Lafayette in the conspiracy, witnesses shielded him. Lafayette also became involved in Charles Fabvier’s plans to subvert the French forces headed for Spain in 1823. Gilbert du Motier, the Marquis de Lafayette, died on May 20, 1834, at the age of 76. Click here to read about his final days and his last words. The Marquis de Lafayette is buried in Picpus Cemetery in Paris. Étienne Charavay, Le Général Lafayette, 1757-1834 (Paris, 1898), p. 374. Bayard Tuckerman, Life of General Lafayette, Vol. II (London, 1889), p. 152. Le Général Lafayette, 1757-1834, p. 384. Life of General Lafayette, Vol. II, p. 158. Le Général Lafayette, 1757-1834, p. 385. Life of Lafayette (Boston, 1835), p. 103. Life of General Lafayette, Vol. II, p. 174. Life of Lafayette, pp. 113-114. Sydney Morgan, France (Philadelphia, 1817), Part 2, p. 132. Sylvia Neely, Lafayette and the Liberal Ideal 1814-1824 (Carbondale and Edwardsville, 1991), p. 98. Life of General Lafayette, Vol. II, p. 209. Bernard Sarrans, Lafayette, Louis-Philippe, and the Revolution of 1830, Vol. I (London, 1832), pp. 224-225. The following year, however, their stay in Paris coincided with the July revolution, when Lafayette was otherwise engaged, being appointed Commander-in-Chief of the National Guards and Governor of Paris at the end of July. They attended his soiree on 24th August, which was “crowded and more brilliant than heretofore – the old gentleman was habited in his uniform – many officers of the new government present.” Later he sent them tickets for a military display. Later this year I hope to type out at least parts of this journal. Wonderful stuff, Geoffrey. You should really consider publishing the journal, or extracts from it – at minimum it sounds like it would make a good article for a historical magazine. I note that Lafayette mourned 3 million French, the victims of Napoleon’s egotism. He didn’t mention the millions of his other victims around the world. What a contrast with a century earlier, when the allies had Louis XIV at their mercy, but Queen Anne gave restraining orders to prevent battle, apparently because she could not bear the thought of carnage. She used to weep over the casualty lists. Very poignant, Geoffrey. Thanks. That’s a period of history I don’t know much about. Statistics done in the past century and several times since then have proved that the number of French casualties were previously immensely exaggerated. They are now proven to have been around 950,000 “only”. What do you understand by “the millions of casualties overseas”? Sorry, “overseas” was careless ( from someone who lives on an island). I meant casualties who were not French, and who did not seem to concern Lafayette. Napoleon had the crown copied for himself, didn’t he? He did, apparently at the cost of 8,000 francs. There’s an article about that here: http://theweddingtiara.com/archives/julius-ceasar-and-emperor-napoleon-laurel-leaf-crowns. I wondered if Blake’s epigram had been inspired by Napoleon’s copying of Caesar’s crown, but I see that it is thought to have been written in 1803, whereas Nap’s coronation was at the end of 1804. The epigram was not published until many years later, so could not have been read by Napoleon’s contemporaries. No historical connection, then, in spite of the aptness. Excellent piece. I did a senior level under-grad paper discussing LaFayette’s tour of America in 1824-25. Thanks for this good question, Lisa. I didn’t go into Lafayette’s wealth and servants since my interest is primarily in Lafayette’s relationship with Napoleon, and in his (Lafayette’s) political activities during the Second Restoration. You might want to read Lafayette by Harlow Giles Unger (2002), which is an excellent biography of the Marquis. Hey, so, I couldn’t find Lafayette’s last words anywhere. I need it for a school project. Can you (or if there are more then I suspect of you, you all) help me find them? But, alas, what could one minor grade do to my overall learning experience? If you scroll down to the section about Lafayette on this post (Last Words of Famous People), you’ll find his last reported words: https://shannonselin.com/2016/02/last-words-famous-people/. Good luck with the project, Teagan. [Napoleon] will risk no personal advantage for the sake of liberty; he has proved that his soul could quite happily watch and even cooperate in its violation.